Prototype: Fish Belly bridge as a gray steel design, similar to the "Fish Belly" bridge protected as a historic monument in Plettenberg, Sauerland in Germany. 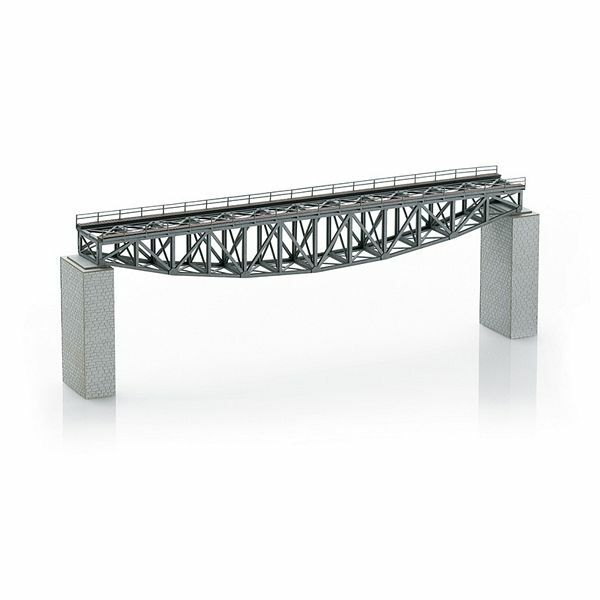 Model: This is a building kit for a single-track "Fish Belly" bridge with the look of steel. Pillars are included. This kit is made of high quality, precise laser-cut architectural cardstock with modelling of the rivets and gusset plates on the girders. The maintenance walkway is also modelled. The pillars have engraving imitating quarry stone. The bridge can be built with commercially available hobby cements. Bridge dimensions without pillars: L 220 mm x W 28 mm x H 29 mm / L 8-5/8" x W 1-1/8" x H 1-1/8". Pillar dimensions: L 15 mm x W 30 x H 60 mm / L 5/8" x W 1-3/16" x H 2-3/8". Trains with catenary can pass under the bridge.